Yes, in this day and age everything’s available online. Except maybe love and there are websites claiming you can find that there too. I do a fair amount of business online myself, especially when faced with a 40% discount. But I still try to make “the rounds” to bookstores, particularly independents and particularly used bookstores. So Friday I took the day off (then spent a chunk of it on work-related stuff). I went to an Army surplus store in Indianapolis which I hadn’t been to before, for two reasons. One was that my emergency “go bag” needed a bit of replenishing and I decided to check this place out. The second was to buy a few ammo cans. For the first purpose, I met with mixed results. I found some light sticks and some parachute cord (I replaced lower-quality rope in my bag) but the MRE’s, which was what I was really looking for, were priced too high. For the second purpose, no, I’m not a survivalist or anything. I do some work with GIS and teach it to kids and ammo cans are fantastic for geocaches. They’re waterproof and for more advanced caches do quite nicely to bury (not all the way – just enough to make someone have to work a bit to find ’em) with a log book and “stuff.” Anyway, I bought a few 7.62mm cans (you can get much larger ones) so the next time I want to wander around the woods for a few hours I can set a couple of caches. Since I was in Indy with some time on my hands I decided I’d neglected the bookstores long enough – I don’t think I had been to them this calendar year. But here’s the real Indy bookstore promo. I picked up a complete 14-volume set of the Nicene and Post-Nicene Fathers: First Series. The version I have was published in 2004 and if it’s used, I can’t see how. I now have the 10-volume Ante-Nicene Fathers set to go along with my new acquisition. All I need is the Second Nicene/Post-Nicene 14-volume set and I will have completed a section of my library I never thought I’d have. 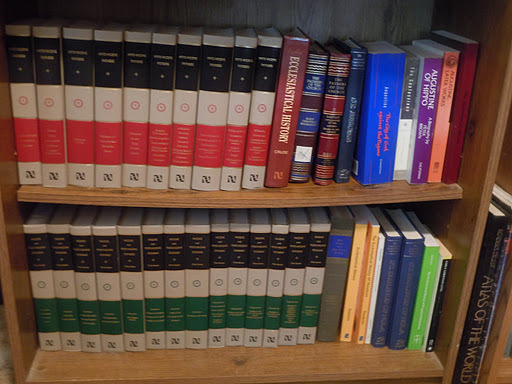 There they are – the top shelf is the Ante-Nicene Set, the bottom shelf my new purchase. Ignore the dust, it has preservative properties – just look at Pompeii! I picked up both these sets somewhat by luck but also by being opportunistic. They weren’t cheap – but for each of them I paid less than a quarter of what they’re listed for by finding them at independent bookshops (my $7/book statement, above, includes these 14 volumes). And I intend to “get lucky” by finding the second series under similar circumstances. So folks, don’t just buy online, or even at conferences. Go to your Indy & used bookstores. There’s absolute gold in them thar hills! My apologies for my second “fluff” post in a row. However I deleted my most recent post as it referred to a post on another blog which has been removed and didn’t want to go through the entire month of July without posting anything. I have a few posts in draft, including a review of what I think is a very good book, but nothing ready to go just yet. Evidently academic freedom ain’t what it used to be – or what I portrayed it as in my blog. Yup, I’m a little pissed. Even more unfortunate, as I write this Guy Halsall’s excellent blog has disappeared. I hope that situation is only temporary. I’ve gained a LOT from it and appreciate his sharing his knowledge and insight with the world at large. Disseminating information to a larger audience (and saying what you think) should never be considered a bad thing.